Audio Publishers Association says 2017 US audiobook market worth $2.5 billion – more than double Data Guy’s BookStat valuation. Who are we to believe? When the Audio Publishers Association issued its latest valuation of the US audiobook market last week the $2.5 billion figure understandably made the headlines. annual US sales survey (conducted by) the Audio Publishers Association (APA) … with the independent research firm Management Practice, alongside a consumer study conducted by Edison Research. Given those parameters we can safely say the APA report is not claiming to be 100% accurate. It is at best a guideline. But a stunning figure if even close. But here we encounter a dilemma. Because on the one hand we have the APA valuing the US audiobook at $2.5 billion in 2017. And on the other hand we have Data Guy’s BookStat, asserting a value of a little over $650 million for the same period. During the last three quarters of 2017, we recorded … $490 million in individually tracked audiobook sales … While this is not quite 100% of online sales during the period, it comes pretty close. Extrapolating Data Guy’s nine month tally for the full year would give us $653 million, a far cry from the $2.5 billion cited here. Overall US ebook dollars and audiobook dollars were pretty flat from month to month: December doesn’t really look all that different than May. Digital book-buyers seem on the whole to be very steady consumers, showing little seasonality in their overall purchasing behavior. So we can safely say that, based on a nine month valuation of $490 million, the twelve month valuation should be about $653 million. Which by any reasonable calculation is a huge difference we cannot dismiss lightly. So is the APA valuation accurate? We don’t know. Is the BookStat valuation accurate? Here we can safely say the answer is no. Because, leaving aside any other discussion about Data Guy’s data collection methodology or his interpretation of that data, there is the small matter of literally hundreds of millions of ebook and audiobook downloads Data Guy deliberately ignores in his BookStat and Author Earnings reports. Libraries remain major access channels for audiobooks and important drivers of audiobook discovery. 52% of people said borrowing from a library/library website was important or very important for discovering new audiobooks. 43% of listeners said they downloaded an audiobook from a library and 14% said that most often use the library for their digital listening. In 2017 OverDrive alone clocked 68 million audiobook downloads. Not a single one of which is measured by Data Guy’s BookStat / Author Earnings reports. Similarly not one of the 155 million ebook downloads through OverDrive in 2017 were measured by Data Guy. Nor are ebook and audio downloads from Hoopla, Baker & Taylor and countless other digital library suppliers. Yet that 2017 OverDrive figure on its own is higher than the 50 million total US audiobook sales Data Guy attributed to 2016 (Feb 2017 AE Report). Data Guy has repeatedly said he doesn’t look at digital library downloads. Take this example from the comments thread of The Digital Reader in 2017. This just beggars belief. Does Data Guy seriously believe publishers and indie authors donate their books to libraries out of the kindness of their hearts? Has he never heard of the various library licencing models whereby libraries have to pay hard cash to publishers (and indie authors) for their ebooks and audiobooks? Facebook COO Sheryl Sandberg’s best-selling “Lean In,’’ released last year by Random House, was available as an ebook to consumers at $12.99, but cost libraries $74.85 to purchase. Indie authors likewise can, and indeed are encourage to, charge a higher price to libraries than to consumers. The exact model will vary from library to library and perhaps from publisher to publisher, and there are countless models to choose from, but as a general rule libraries pay a hefty fee for the licence to loan an ebook or audio book for a specified number of times, per this report from Bookwire Dosdoce. None of this revenue feeding through to publishers and authors is being documented by BookStat or Author Earnings. It is a black hole that Data Guy finds convenient not to shine any light on. No other data set in our industry comes close to matching ours for full-market coverage, let alone timeliness. Legacy data providers like PubTrack Digital and the AAP are effectively blind to vast sectors of the consumer ebook & audiobook market … which is why more and more publishers have privately sought out our data and analysis–which gives visibility into the industry in real-time, and *includes* all those untracked purchases that these other industry data providers can’t see. …If a book sold even a single online copy since April 2017, no matter whom the publisher or author, we can probably find it in our ever-growing dataset. The reality is of course that Data Guy’s BookStat and Author Earnings Reports are not just “effectively blind,” but deliberately blind to what in 2017 amounted to almost a quarter billion digital downloads, and in 2018 will be considerably higher, on the nonsensical grounds that authors do not earn from library books,. While all the time conveniently including Amazon subscription and Prime Reading downloads. This warps both the unit and dollar valuations of the US market, gives us a faux view of the balance of power between traditional and non-traditional publishers in the digital publishing sector, creates a faux impression of Amazon’s true market share, and leads small publishers and authors to conclude digital libraries have nothing to offer. This accords nicely with the classic Author Earnings agenda. Most ignored library downloads will be traditionally published books, as few indies are even aware they have the option, while few traditional publishers have titles in the Amazon subscription services Data Guy makes a point of including. 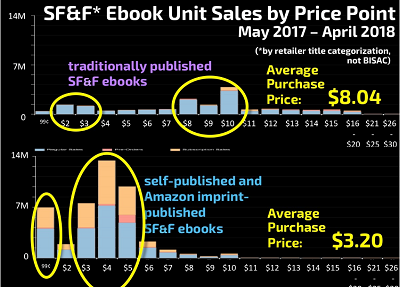 We saw this disturbing bias most recently in the Author Earnings Report to the SFWA Nebula Conference last month, where Data Guy deliberately lumped together self-publisher sales and Amazon imprints sales to stack up against traditional publishers. What’s intriguing is just how long this juggling act can continue as Data Guy now uses data paid for by Big Pub to produce Author Earnings Reports deliberately slanted to show traditional publishing in an unfavourable light. At least with Author Earnings we knew where we stood. The agenda was clear, and the insights were, providing we didn’t take them as gospel, a useful guideline. But as per a TNPS post a month ago, Data Guy’s numbers are beginning to show signs of strain. In 2016 Data Guy was valuing the US ebook market at $3.2 billion in 2016 then down to $1.7 billion in 2017, while insisting ebooks sales are rising (and also managing to count JK Rowling’s books twice). GDPR. The Facebook scandal. Amid mounting privacy concerns, Data Guy continues to sell author’s private sales data to Big Pub. But is it even accurate? But now Author Earnings is BookStat, accuracy is supposedly close to 100%, yet there is this incredible difference of one and a half billion dollars between the valuation Data Guy is giving us for audiobooks in 2017 and the numbers the Audio Producers Association is giving us for the same period. Chances are neither figure is accurate. But what we can safely say is that Data Guy’s numbers, by deliberately ignoring such a large sector of the digital market, for both ebook and audio, is not showing us the true picture.